You know how board gamers can score a “Get Out of Jail Free” card in “Monopoly”? Well, despite being forced to relinquish his UFC bantamweight title due to various injuries that has kept him sidelined for over two years, former champion Dominick Cruz (pictured) apparently has a “Get an Immediate Title Shot” card stashed away in his back pocket. UFC president Dana White revealed Saturday he would grant Cruz an instant crack at the crown upon his return. However, White cautioned Cruz that if reigning champ Renan Barao is still sitting atop the throne when that time comes, the “Dominator” might want to choose a different, less violent path back to the octagon. 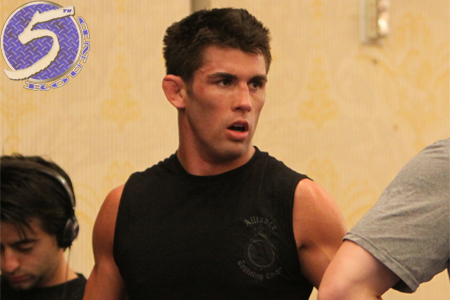 “I, literally, have heard nothing from Dominick Cruz,” White stated. “I don’t know what’s going on with him. And I don’t think after this much of a layoff it would be right to throw him in there for [an immediate title shot], unless he wants it. Cruz was slated to unify the belt against then-interim champ Barao at UFC 169, but the injury prone 29-year-old suffered yet another setback by tearing his groin and was forced to withdraw. Because of Cruz’s extended absence, White stated prior to the February event that he was going to strip Cruz of his belt if he wasn’t able to return against Barao. Barao was then anointed the division’s outright king. Cruz owns a dominant 19-1 professional record. The lone blemish on his résumé came in a submission loss to Urijah Faber back in March of 2007. No word on when Cruz is hoping to return to action, or if he’ll cash in his “Get an Immediate Title Shot” card when he does.